this still holds a special place in my emotionally abused heart. Amatriciana is named after Amatrice, a town once part of the Abruzzo region, but in the 20th Century was handed over to Lazio, becoming part of the Rieti province. It is this area, nestled in between the Abruzzo and Lazio regions, that is known for hearty peasant/shepherd dishes. Some of the best cooks are known to come from Abruzzo, so put those facts together and you have an amazing cuisine. Though Bucatini, a thick, spaghetti-like, tubed pasta, is the most commonly used for the Amatriciana sauce, purists claim you must use Spaghetti. In fact, a sign that greets visitors who enter Amatrice proudly states, “Amatrice: City of Spaghetti”. Believe it or not, while it may sound like an American misspelling, locals in and around Amatrice actually call the sauce/dish ” la Matriciana”, eliminating the first “a”. In Italy, the meat used to make “l’ Amatriciana” is Guanciale, the jowl or cheeks of a pig. Guancia in Italian means “cheek” and hence the name. Outside Italy, Guanciale is hard to find, so Pancetta is used instead. Sadly, Americans (and probably by now, new-age Italians, which are even worse) want to use smoked bacon in their Amatriciana, completely missing the point of the flavors and how they are to amalgamate. Traditionally, “strutto” (rendered pork lard) was used instead of olive oil, contributing to the sauce a rich complexity and structure. Onions can be used but traditionalists do not. White wine is commonly used in Rome when making this sauce, but again, traditionalists would not. Either way, a nice spoonful, or two, of grated Pecorino Romano goes perfectly with this dish. A variation of Amatriciana is “alla Gricia”, essentially an Amatriciana without the tomato sauce. Supposedly, the shepherds from Grisciano, a town part of Accumoli, a municipality near Amatrice, did not use tomatoes. Either way, both dishes are to be tried and loved. To spice it up, you MUST include hot pepper “peperoncino”. Black pepper is optional. Side note, do not confuse either of these two dishes with “carbonara”, a similar dish that is a “Gricia” (without tomatoes), that instead includes eggs. An easy drinking Umbrian, Laziale, or Abruzzese white with crisp acidity would go well with Amatriciana and help cut through the fat. If you have red on your mind, the options are endless. While Lazio is not known its red wines, the home favorite, Cesanese, goes well, as would other regions’ wines such as Nero D’Avola (Sicily), Primitivo (Puglia), or Valpolicella (Veneto). To celebrate my birthday, I went with the very special (and closer to Amatrice) Emidio Pepe Montepulciano D’Abruzzo 2003. Every time I drink this wine I immediately think of Charles Scicolone, wine hero and advocate of classic style wines. In his many great writings, Charles frequently mentions Emidio Pepe. Stay tuned for an interview. Montepulciano is one of the most planted grapes in all of Italy, used mostly for inexpensive, easy drinking wines or blended with other grapes. Most of Italy was organic and even biodynamic before it ever became cool here in the States as a subconscious way to create a new identify for one’s self and distance that new self from a seemingly embarrassing past. In Italy, organic and even biodynamic are just the way things are done. Emidio Pepe is the Ferrari of Montepulciano D’Abruzzo and his wines are both organic and biodynamic. He only makes one red wine (Montepulciano) and one white (Trebbiano). The red grapes are crushed by hand while the white by foot. Yes, you read that correctly. At the winery, all the wine is hand-decanted into each bottle. Yes, you read that correctly as well. Please re-read this last paragraph to fully appreciate the passion of a true artisan like Emidio Pepe. Pepe’s wines are meant to age up to 30 years. They are well balanced masterpieces. His 2003 elegantly displays earthy notes of licorice, pepper, and herbs, complimented by black cherry hints. 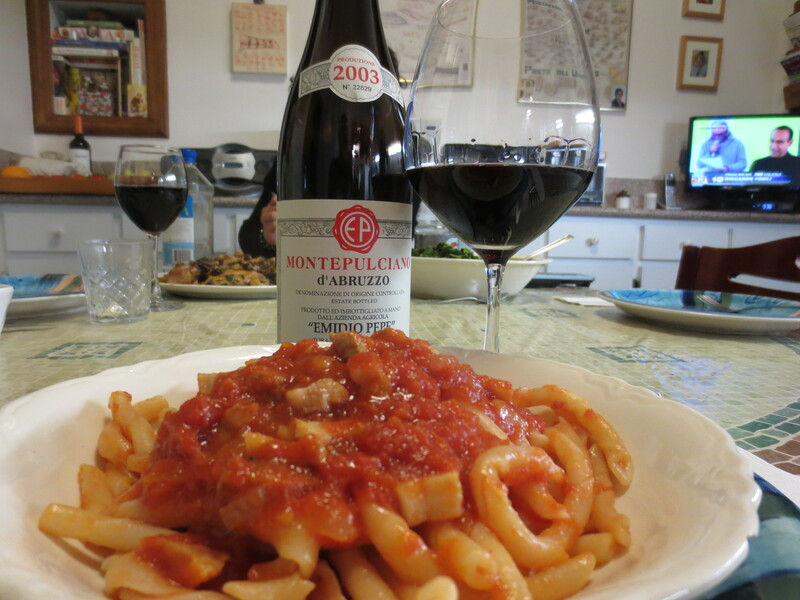 This entry was posted in Food and tagged Amatriciana, Pasta, Montepulciano, Charles Scicolone by piazzalife. Bookmark the permalink. Yes I agree ! Thank you Charles !! You’re the best !